Liberal Party strategists have started their 2019 campaign preparations in earnest, focusing their energies on Conservative Leader Andrew Scheer and their plan to aggressively brand him as "Stephen Harper 2.0" ahead of the next election. Liberal MPs at the caucus retreat in Saskatoon took part in a briefing last night on the party's readiness ahead of the 2019 election — a briefing that placed heavy emphasis on defining Scheer as a protégé of the former prime minister, sources inside the caucus room said. MPs were shown polling that suggests Harper is still deeply unpopular with key segments of the electorate that the Liberals will need to motivate to win re-election. Liberal insiders also say their polling is telling them Scheer is still an unknown quantity for many voters. That could give the Liberals an opening to define him in the eyes of Canadians as the man carrying the torch for Harper's political legacy. 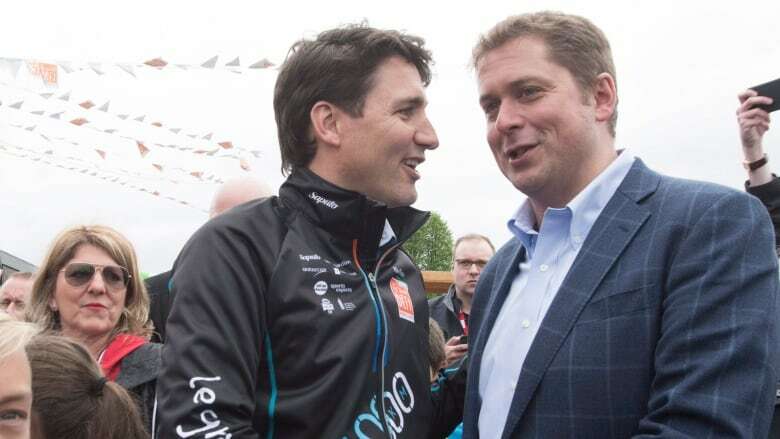 It's a continuation of a tactic first floated at the party's convention in Halifax, when Prime Minister Justin Trudeau launched a blistering attack on Scheer in his keynote address in which he said Scheer might be leader now, but "it's still Stephen Harper's party." Indeed, the 'Scheer as Harper' strategy has started to creep into the prime minister's public comments. In a campaign-style speech to MPs ahead of the caucus retreat Wednesday, Trudeau launched a broadside against the Conservative party but didn't even mention Scheer by name. Instead, he invoked the memory of Harper, blasting the party's record in government while contending the Tories have "absolutely no plan for the economy." Liberal MPs publicly acknowledged Thursday they plan to capitalize on Harper's personal unpopularity with portions of the voting public, and also on his perceived mishandling of the economy. "Our plan is to tell Canadians about our economic record, about how Canadians are better off under a full mandate of Justin Trudeau. We think we have an awful lot of great accomplishments to put in front of Canadians," Quebec MP Steven MacKinnon, a former national director of the party, said Thursday. "But look, Mr. Scheer has a duty here. He's run five times under Stephen Harper. He hasn't told us, in any way, how he would differentiate himself from Stephen Harper and until he does that, I think Canadians have every reason to worry about Stephen Harper part two." Liberals say Scheer handed them a gift when he described himself as "Stephen Harper with a smile," building on a narrative they already had in the works — something acknowledged by one of Trudeau's cabinet ministers Thursday. "He did it himself and we're not going to contradict him. He compared himself to Stephen Harper with a smile and I'm not going to contradict him," Heritage Minister Pablo Rodriguez said on the sidelines of the retreat Thursday. "I think it's clear that the Conservative Party of today has not learned its lesson from the last election, from the 2015 election," Alghabra said. "The Conservative Party of Stephen Harper has built a strategy on fearmongering, on pitting Canadians against Canadians, and we're witnessing a repeat of that strategy today in the House of Commons," he said — an apparent reference to the party's electioneering over the niqab veil and a proposed 'barbaric cultural practices' hotline during the last election campaign. "Andrew Scheer has to answer to Canadians why he's following the same recipe as Stephen Harper." The Conservatives, meanwhile, have sought to define Trudeau as a PM out of touch with the average Canadian, a leader intent on burdening families with higher bills through a national carbon tax. Scheer has said he wants the next campaign to be a referendum on the federal government's plan to impose a price on carbon on all provinces, regardless of buy-in from provincial leaders. But the former Commons Speaker maintains he will run a "positive" and optimistic campaign that will focus on the strength of Conservative Party ideals — a Canada "where taxes are low, government is limited, opportunity is equal, freedom is celebrated, and people are put first," as Scheer said in his speech to delegates in August. And while the Liberal Party might be sharpening its election message, the Conservatives are well ahead in other aspects of campaign planning. In the most recent quarter, the Tories raked in nearly twice as much money as the Liberals — though Liberal Party officials have said the Conservatives spent more to actually collect those funds. The Tories also have nominated well over 100 candidates for the next election campaign, while only 26 Liberals have so far been named as candidates. "Nominations are proceeding all across Canada as more and more Liberal MPs and unheld ridings meet their community engagement targets well ahead of schedule," a spokesperson for the Liberal Party said. Incumbent Liberal MPs must meet a number of targets — at least 3,500 knocks on doors, or 5,000 phone calls within the community, and a series of fundraising goals — before they can be nominated again to run in 2019.